24 small slider buns brioche or challah buns are specially good with this! For the marinade: Heat a large skillet or comal over medium heat. Add the dried guajillo and ancho chiles and toast them for no more than 20 seconds per side, taking care not to burn them. Transfer the toasted chiles to a medium saucepan and add the water, place over medium heat and cook for 12 to 15 minutes, until the chiles have softened and rehydrated. Transfer the chiles to a blender, and add 2 cups of their cooking liquid (discard the remaining liquid), the vinegar, tomato, onion, garlic, oregano, cinnamon, allspice, black pepper, cloves and salt. Puree until smooth. Wipe out the medium saucepan and add the oil. Place over medium heat for 1 to 2 minutes, then add the pureed chile mixture, being careful to avoid any splatters. Partially cover and cook for 10 to 12 minutes, stirring once or twice, until the color darkens and the mixture thickens to a paste-like consistency. For the meat: Place the beef in a large bowl and cover it with the marinade. If you will not cook it that day, cover and place in the refrigerator for up to 48 hours. Wrap the individual meat chunks in pieces of banana leaf or aluminum foil as you would wrap burritos or tamales - making sure to add a generous amount of marinade in each packet. Preheat the oven to 350°F. Place the meat packets inside a large, heavy ovenproof French oven or casserole, pour in the beer and cover with a tight-fitting lid. Roast for about 3 hours, until the meat is succulent and comes apart when pulled with a fork. Transfer to the stovetop (off of the heat), and let everything rest for 10 to 15 minutes before opening the meat packets. Serve on slider buns with drunken salsa and/or pickled jalapeños. I was making this recipe tonight, I seeded the chiles AND then soaked them! I completely forgot to toast them! Can I set them out to dry and use them again or am I doomed! I should mention that they soaked for maybe one full minute before I realized my error and quickly drained them. Will the flavour have left these delicate morsels or can I still dry, toast and reuse them again tomorrow? Oh don’t worry, Monica! Part of the fun of cooking is making mistakes and adapting…and Mexican cooking is very forgiving. If you didn’t have a chance to toast them…you can keep going with the recipe and it will still be delicious. I have a question. I watched your video on Youtube and you serve the sliders with some cabbage. Is it pickled or just plain? My family loves pickled ingredients. I am planning on making these for my daughter’s 12 birthday party. Oh I don’t have a recipe for that slaw specifically, but here are some creamy versions: https://patijinich.com/recipe/creamy-green-slaw/ https://patijinich.com/recipe/creamy-slaw/ And here are some pickled recipes too: https://patijinich.com/recipe/pickled-red-onions-a-la-yucateca/ https://patijinich.com/recipe/pickling_jalapenos/ I hope your daughter has a wonderful birthday, Maria Alicia! Prepare este paltillo y a todos les encanto. Mis suegros quedaron muy impresionados! Mi camisa está manchada con chile pero valió la pena! Gracias de nuevo por compartir sus platillos deliciosos! No puedo esperar para probar otra receta! Can I substitute a chuck roast? Sure! Any meat that likes to be braised will be great. Me sentí como la rata de la película Rattatuili y el libro del chef Custoe, everybody can cook!!! Por cierto las hojas de plátano se me quebraron. Una amiga me dijo que las calentara un poco en un comal antes de envolver la carne. Gracias Pati por quitarme el miedo de aventurarse a la cocina, mi esposo le encanta verte en TV y en youtube dice que tenemos el mismo acento y le encanta. I’m so excited to try and make this! I just have two questions.. Using aluminum foil, should the meat be wrapped a little loose? If it’s completely sealed can the beer penetrate it to do its thing? Also, how would I use a crockpot instead of the oven? Low? High? How many hrs? I guess that was more than two, hah. Thanks for taking the time. You and your recipes are inspiring! ​You know? You can skip the wrapping. If you are using a crock pot, follow same method as when you braise a similar kind of meat! As a full time worker, student and mom the weekdays are chaotic, so I look for hearty home made meals to make on the weekends. This one was AMAZING! The banana leaves gave it a delicious flavor. My parents enjoyed it as well. Instead of making sliders, I made it as an entree with rice, beans and homemade flour tortillas. Thanks for sharing the recipe! Thank YOU for trying it, Nixya! I’m so glad you all enjoyed it! Hi Pati, we love your show! Is there a style of premade store marinade you can recommend as a substitute? Pati, Wow! This is a great recipe. We have an old family recipe (Sonora style) that we make and love. It does not compare to how good this one is. I made it along with tortillas de harina (homemade) and it was a match made in heaven. Thank you for all of your hard work! Oh wow thank you David! Terry…give it a try and let me know if you like it! I added 2 tsp of liquid smoke to the pureed and cooked pepper mixture. The meat was marinated as instructed, then cooked in banana leaves in a slow cooker. The liquid smoke did add a smokey flavor. However, more than a tsp or 2 would probably not be too good because too much liquid smoke would make the dish bitter. This is a terrific recipe that I hope one day to prepare in an underground oven just to taste the dish as it is traditionally prepared. Thank you. You are my hero. I saw your video and I was amazed. I changed the recipe so the meat was left marinating over night. Then I put it in the oven with 12 oz of fresh squeezed orange juice. It was succulent. Oh thank you so much Asael! How do you keep the Banana leaves from cracking when wrapping. Sadly, most of my banana leaves cracked and leaked some filling, but it was still excellent to eat. Thoughts? ​Oh, you should pass them through a burner flame and/or rinse with warm water. ​ ​That should help! My children, 3 girls, LOVE these! Quick question, what about the five cups of water. When does that get used? It’s for the marinade, once you have toasted the dried chiles, put them in a medium saucepan with the water to rehydrate them. My mom has moved in with me to care for her. We love looking at all your cooking shows for new recipes.That is “our” time. I’m looking forward to making this for my mom. Thank you,God Bless & continued success! ?❤? That’s amazing that you are cooking and taking care of your mom. Sending you my best! I have a question about the peppers. When I make Chile Colorado, I use New Mexico and Guajillo chiles. To prepare them, I remove the stem and seeds, toast them in a hot skillet, put them in a pot with water, bring to a boil and then let them soak for 30 minutes. I process them and then I put them through a strainer to remove the bits of skin. If I don’t do this step, there will be flecks of skins in my Chile Colorado. 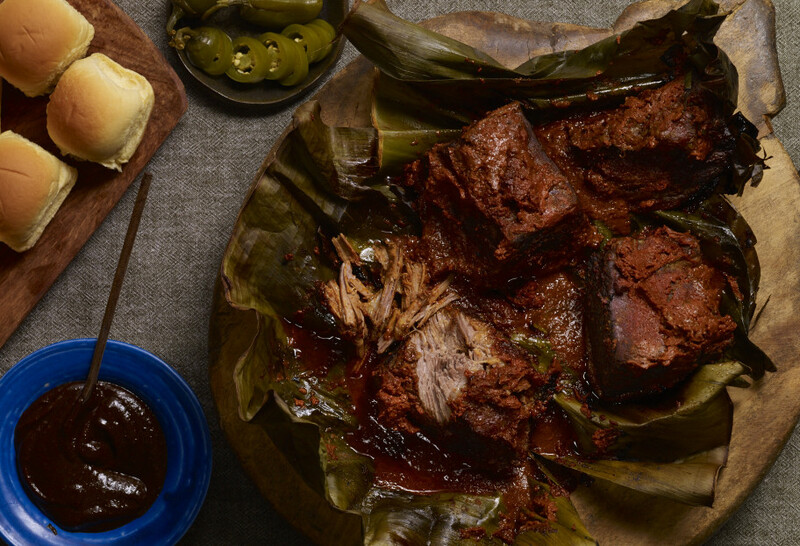 I noticed when you make the Barbacoa, you simmer the Ancho and Guajillo chiles and put them through a processor, but don’t strain them to remove the skins. Won’t there be flecks of the skins in your Barbacoa? I want to make the Barbacoa and I’ve already purchased my 9.5 quart Le Cruset but I don’t want the pepper skins in there. Thank you for a great show! I never miss and always record them for reference. Gracias! Hi Joan! If you don’t want the flakes of skin, I recommend that you strain it. Enjoy! I’ve now made beef barbacoa two weekends in a row! The first weekend I followed the recipe verbatim and it came out gorgeous. The second weekend I used a whole cut of brisket and applied the recipe to a slow cooker. I am seriously considering making this recipe again this Friday because it is so so good! Thanks for an amazing recipe! I’m so happy to hear that you enjoyed it, Aaron! Pati, I love, love, love watching you cook and I can’t wait to make this. Can you please tell me the size of the large orange French oven you used to cook the beef wrapped in the banana skins? I want to be sure I have one large enough. Gracias! This recipe looks so yummy! I always loved making American BBQ pulled pork or beef. I had a question though. I know it says to serve it with salsa borracha. But can you also heat up any leftover barbacoa not used for cooking the meat as extra sauce? Is the drunken salsa you mention here the drunken prune & orange salsa? My husband and I Just seen show for 1st time, looked so delicious n easy to do. Can’t wait to try it!! Thank you. Oh good! Hope you like them. The picture shows red cabbage slaw. I tried to find a recipe on your site, but no luck. True! It is shredded red cabbage (2 cups) mixed with lime juice (3 tablespoons), olive oil (3 tablespoons), agave syrup (1 tablespoon) and salt to taste. Thank you so much. Mucho gracias! My family loved the sliders and the crab jicama salad! If you don’t wrap the meat in packets, would you just mix in the beer with the marinade before roasting in the oven? What you would do is place the meat on a chicken or turkey holder, without cutting it in smaller pieces and pour the beer under it, the close the baking dish with aluminum foil or banana leaves. Hi Javier, So happy you guys found my show! You will have to let me know what you try!! I’ve seen this recipe on PBS. The concept of slow cooking in banana leaves with guajillo sauce and light beer was very interesting. I tried using beef short ribs in place of lean meat in a slow cooker. The result was very good and the flavor was great. My husband and I loved it so much. Thanks for the recipe, Pati. Your variation sounds awesome, Connie! What could I substitute the beer with? Hola Barbara, For the Pasilla, Prune and Orange Salsa, you can just use an extra cup of boiling water to replace the beer. I made this last night and it’s already all gone! My mother (my pickiest eater) even had seconds. I knew it.was a winner when I blended it all together and it smelled like my suegras coveted birria. I actually didn’t cook the sauce beforehand. I simply forgot and by the time I remembered, itwas already in the baking dish. I also didn’t individually wrap the meat. I made it more like a cochinita pibil and it was still incredibly delicious and tender! YUM! So happy to hear you made it your very own, sounds delicious.